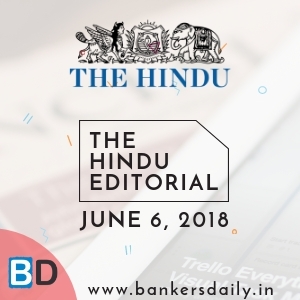 THE HINDU EDITORIAL – September 10, 2018 is one of the must read section for the competitive exams like IBPS RRB PO, IBPS RRB Office Assistant 2018, RBI Grade “B” 2018 & NIACL Assistant 2018. These topics are widely expected to be asked in the reading comprehension , Cloze Test or Error Detection topics in the forthcoming exams. So gear up your Exam preparation and learn new words daily. The India-U.S. 2+2 meeting on September 6 between the Defence and Foreign Ministers of the two countries appeared to be a singularly one-sided affair. Washington was calling the shots, and New Delhi was trying to wriggle out of U.S. pressure without much success. The inaugural round of the 2+2 Dialogue is therefore ‘advantage U.S.’ While carefully analysing the outcomes of the talks and the future direction of India-U.S. relations, it is difficult to get overjoyed by heart-warming American phrases like “India is a consequential emerging partner” or Washington naming and shaming Pakistan. Let’s look at the bigger, more nuanced and consequential picture. 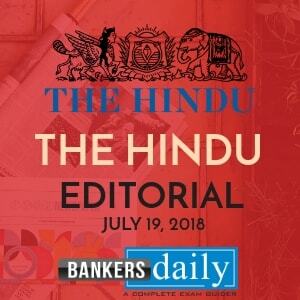 Second, Washington seeks to impose the punitive provisions of a U.S. federal law called Countering America’s Adversaries Through Sanctions Act (CAATSA) on countries dealing with Russian defence and intelligence sectors, making it difficult for India to buy the much-needed S-400 missile system. For a country with close to 60% of its weapons systems originating from Russia, this would be a huge setback. Again, it’s clear the U.S. would like India to buy its weapons instead. There is still no clarity on whether India’s request for a “one-time waiver” was granted by the U.S. to buy Russian weapons at the 2+2 meeting; the joint statement is silent on this. If such a waiver was indeed not granted, it must be considered a major set-back. 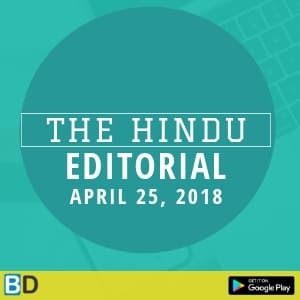 In the run-up to the 2+2 meeting, the U.S. also put considerable pressure on India to reduce the bilateral trade deficit, which is in India’s favour, by buying more American goods. During the 2+2 meeting, the two countries also signed the Communications Compatibility and Security Agreement, or COMCASA. The agreement is one of three considered to be “foundational” for a viable India-U.S. military relationship. In 2016, India and the U.S. had signed the Logistics Exchange Memorandum of Agreement (LEMOA), allowing their militaries to replenish from the other’s bases. The third, the Basic Exchange and Cooperation Agreement for Geo-spatial Cooperation (BECA), is yet to be negotiated. It is necessary to take stock of the national security implications of these agreements. The argument in favour of signing COMCASA is that it “will facilitate access to advanced defence systems and enable India to optimally utilise its existing U.S.-origin platforms”. India’s U.S.-sourced P-8I and C-130J aircraft had to use low-tech communication equipment as the U.S. could not provide India with such technologies due to domestic legal restrictions, unless India signed COMCASA. Moreover, in the absence of COMCASA, and the attendant high-tech equipment, the interoperability between Indian and U.S. forces would be severely hampered. While there is some merit in this argument, given that the India-specific COMCASA is not a public document, we do not know the scope of the agreement. Therefore, the government needs to clarify several concerns. For one, there is the issue of visits by U.S. inspectors to Indian bases to carry out inspections on the COMCASA-safeguarded equipment sold to India. No doubt, South Korea is a U.S. military ally, which India is not. So one hopes that the provisions of inspections would be less intrusive. But there is no getting away from the fact that COMCASA will apply end-use monitoring and reconfiguration restrictions on India as well. In any case, by signing COMCASA and by agreeing to reduce the purchase of Russian weapon systems (in line with CAATSA), India has implicitly accepted the extraterritorial application of U.S. law on itself. While it is true that the original End-Use Monitoring Agreement (EUMA) was agreed to between India and the U.S., in 2009, New Delhi has now taken the application of U.S. federal law on India to a completely new level. EUMA had reportedly ensured that U.S. inspectors would stay away from Indian bases: is that ensured under COMCASA as well? Moreover, did India push for a U.S. presidential waiver for receiving COMSEC equipment and materials without having to sign COMCASA? Even though the “Joint Statement on the Inaugural India-U.S. 2+2 Ministerial Dialogue” did not explicitly mention China, the section on the Indo-Pacific region implicitly referred to it. There is no denying the fact that the “China threat” is one of the major talking points between Washington and New Delhi today. While China is indeed a challenge, there is only so much India-U.S. cooperation can do to address that challenge for India. India is an Asian country, with several Southern Asian security challenges, and its ability to meet those challenges with the help of an offshore (and declining) superpower is at best limited, and counter-productive at worst. The India-U.S. relationship shouldn’t be allowed to define India’s geopolitical character, strategic future or the limits of its other bilateral relationships. 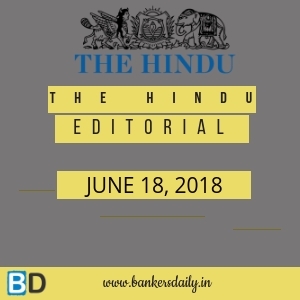 In a world that is far more chaotic than ever since Independence, India must keep its options open and be multi-aligned, even as the U.S. forms a key part in that scheme of things. The conference of the UN Framework Convention on Climate Change in Bangkok last week, that was to draft a rulebook for the Paris Agreement ahead of a crucial international conference in Poland in December, ran into predictable difficulties over the issue of raising funds to help poorer nations. Some developed countries led by the U.S. — which, under the Trump administration, has rejected the agreement — are unwilling to commit to sound rules on raising climate finance. Under the pact concluded in Paris, rich countries pledged to raise $100 billion a year by 2020 to help developing countries reduce their greenhouse gas (GHG) emissions and aid populations to cope with extreme events such as floods, droughts and storms. Obstructing the transition to a carbon-neutral pathway and preserving the status quo is short-sighted, simply because the losses caused by weather events are proving severely detrimental to all economies. By trying to stall climate justice to millions of poor people in vulnerable countries, the developed nations are refusing to accept their responsibility for historical emissions of GHGs. Those emissions raised living standards for their citizens but contributed heavily to the accumulated carbon dioxide burden, now measured at about 410 parts per million of CO2 in the atmosphere, up from 280 ppm before the industrial revolution. There is international pressure on China and India to cut GHG emissions. Both countries have committed themselves to a cleaner growth path. India, which reported an annual CO2 equivalent emissions of 2.136 billion tonnes in 2010 to the UNFCCC two years ago, estimates that the GHG emissions intensity of its GDP has declined by 12% for the 2005-2010 period. As members committed to the Paris Agreement, China and India have the responsibility of climate leadership in the developing world, and have to green their growth. What developing countries need is a supportive framework in the form of a rulebook that binds the developed countries to their funding pledges, provides support for capacity building and transfer of green technologies on liberal terms. If scientific estimates are correct, the damage already done to the West Antarctic Ice Sheet is set to raise sea levels; a 2° Celsius rise will also destabilise the Greenland Ice Sheet. Failed agriculture in populous countries will drive more mass migrations of people, creating conflict. A deeper insight on all this will be available in October when the Intergovernmental Panel on Climate Change releases its scientific report on the impact of a 1.5° C rise in global average temperature. This is the time for the world’s leaders to demonstrate that they are ready to go beyond expediency and take the actions needed to avert long-term catastrophe. Meaning : twist and turn with quick writhing movements. Meaning : turn away (one’s eyes or thoughts). Meaning : a set of reasons or a logical basis for a course of action or belief. Meaning : fill (something) up again. Meaning : the ability of computer systems or software to exchange and make use of information. Meaning : causing disruption or annoyance through being unwelcome or uninvited. Meaning : an approximate calculation or judgement of the value, number, quantity, or extent of something. Meaning : in a way that is not directly expressed; tacitly. Meaning : denoting the freedom of embassy staff from the jurisdiction of the territory of residence. Meaning : the action of keeping something secret or the state of being kept secret. Meaning : involve (something) as a necessary or inevitable part or consequence. Meaning : able to be predicted. Meaning : commit (a person or organization) by a solemn promise. Meaning : block (an opening, path, road, etc. ); be or get in the way of. Meaning : tending to cause harm. Meaning : tie or fasten (something) tightly together. Meaning : willing to respect or accept behaviour or opinions different from one’s own; open to new ideas. Meaning : upset the stability of (a region or system); cause unrest or instability in. Meaning : the quality of being convenient and practical despite possibly being improper or immoral; convenience. Meaning : the process or a period of changing from one state or condition to another. Meaning : the arrangement of parts or elements in a different form, figure, or combination. Meaning : relating to the identification of long-term or overall aims and interests and the means of achieving them. Meaning : move (some of a company’s processes or services) overseas. Meaning : in the best or most favourable way. Please increase the font size. It is not that attractive to read. Everything else is fine. Sure Will increase the font size in all the upcoming posts.thank you for your valuable comments.